Libby Larsen is a popular and productive composer who has written twelve operas and has over fifty CD recordings to her credit. She co-founded the American Composers Forum and is an energetic advocate for the music and musicians of our time. The three Cowboy Songs draw on American texts from West of the Hudson, intentionally avoiding “contrapuntal artifice and excess melisma” to tell the stories of Bucking Bronco and Billy the Kid with disarming directness. 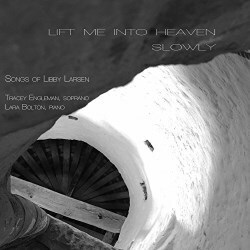 The dreamy title track Lift me into Heaven Slowly is the soft centre to this set. Songs from Letters takes its texts from “Calamity Jane’s Letters to her Daughter”, involving themes that struck a chord with Larsen, who was dealing with the issues of working and motherhood at the time. The songs cover the dramatic events of gunfights and the mother’s pride as a working woman and points of advice for and messages to her daughter, such as not letting jealousy take over your life and the ultimate regret of being only left with pictures rather than the people they portray. This cycle has the hallmarks of a mini-opera and covers wide-ranging stylistic touches from angular modernity to moments of stride piano playing. My Antonia has a main character called Jim, the clear musical imagery of train travel taking us through the landscapes of the Midwestern plains and expanding on Jim’s relationship with Antonia, its connection with the seasons of the year and the hardships of frontier life. There are nice contrasts here, for instance between the freezing imagery of Winter confronting the blowsy waltz that introduces the Hired Girls. These are more vignettes than something that forms a quasi-operatic narrative, but is none the worse for that. The penultimate song Antonia in the Field is a lovely point of repose before the final Sunset as the train once again transports us from one world to another. Try Me, Good King: Last Words of the Wives of Henry VIII is self-explanatory as a title, the texts taken from the last letters and gallows speeches of five of Henry VIII’s sic wives. Larsen has written that “in these songs, I chose to focus on the intimate crises of the heart. This group of songs is a monodrama of anguish and power.” This is certainly the case, with the urgency of repeated notes creating tension, and fragments of lute songs from Elizabethan composers such as Dowland and Campion heightening the contrasts of momentary tenderness and reflection with the nightmare inevitability of violent death. This is an attractive collection though there are some subjective caveats. Tracey Engleman is a superb singer but her operatic delivery is to my ears a little lacking in the contrasts of timbre that make the performance of art songs particularly special. She can go soft as well as hitting those dramatic climaxes, but if you are less keen on big-boned vibrato then this may not be for you. The opening of the very last song, Katherine Howard, shows that she has the technique to adapt this into a more intimate sound, but for the most part she chooses not to use this quality. The piano sound is ok for the most part, if a little boxy and remote in what sound like highly controlled studio circumstances.